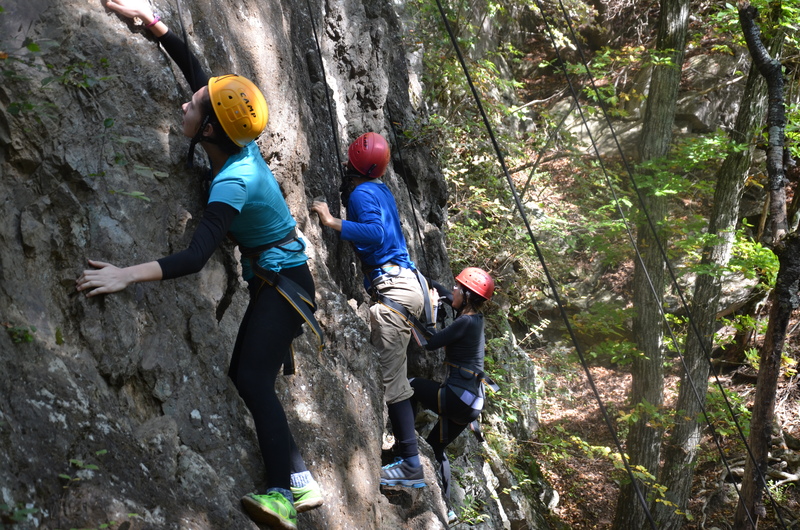 Each year, eighth graders face both individual and team challenges during their Outward Bound experience. They take buses to the Kangakuen Camp at Lake Sai near the base of Mt. Fuji and participate in challenges that include cooking their own meals over campfires, rock climbing, orienteering, raft building and maneuvering their team over a 15 foot wall. Four students submitted reflections on the trip. Lake Sai. A dusty campground, a lake and a beach. A place where people grow beyond what is comfortable. A place where people work as a team and grow closer together. Day one was rafting. We tugged on (with great difficulty, I might add) wetsuits and windbreakers. These wetsuits and windbreakers tried to block the cold, but ultimately failed. After waddling out to the beach, we began building. We tied inner tubes and boards together to create a durable raft that we hoped would hold up to the weight of all nine of us. As we had hoped, we managed to touch all three buoys in the lake in just over seventeen minutes. Seventeen, as it turned out, would become the magic number for the week. Day two had trust initiatives and orienteering in store for us. We started with a few smaller activities. The most memorable of the smaller initiatives was jump rope. The goal was to get thirty jumps in a row with all of our group. We got seventeen. Coincidence? I think not. Next was quite possibly the activity that we had heard the most about: The Wall. This was an exercise that I think brought our group very close together, seeing as we had no ropes holding us up. We had to rely on our group completely. My arms were sore for days. Afterwards, we attempted the spiderweb, which proved itself (to me at least) the most difficult feat at Lake Sai. Orienteering was tiring, as most of what we did was walk for about 1 hour and 40 minutes. I would tell you more, but I’m going to follow my rule when it comes to books and movies. No spoilers! Day three was rock climbing. Now, let me tell you something. It should not be called “rock climbing.” It should be called “hiking for forty minutes and then climbing a giant rock face.” I loved it, but I’m pretty sure I nearly broke my ankle. The hike up was tough, being that it wasn’t really on a trail. The rock climbing in itself is probably where I grew the most on this trip. I’ve always rock climbed indoors. Outdoors is something completely different. I thought that I was going to die, even though I knew that I was completely safe. But what did they want me to come back with? What was the mystery they wanted me to unlock? I looked out the window of the bus on the way there, wondering what Sai would be like, wishing that we could push a button and fast-forward to the Tokyo Culture Day events but, now that I think about it, that’s not what I want. Now I wish I could go back in time, I want to relearn what I learned at Lake Sai. But by now you’re probably falling off your seat just waiting for me to tell you, since I’ve been dragging this paragraph on and on, and not giving you a main idea. This is what I came home with from Lake Sai: completion. After every challenge, there was a feeling of completion. A long day was completed by a relaxing bath at an onsen, but the entire trip was completed by the feeling of comfort when I got settled back at home, and sat on the couch for the first time in three days. But what made this trip special wasn’t really the sense of completion itself, it’s the work and dedication I had to put in to get to the goal, cross the finish line or even climb a wall with nothing but your team supporting your entire body. When you make it to the top, and you make the final stretch, it’s as though nothing could feel better, as a sense of relief and victory settles in your skin. In the beginning I honestly didn’t want to go to Lake Sai. I was afraid of the challenges I was going face during this trip and wanted to just stay home. As the bus pulled up to the campsite, I was intimidated by the trees and the unfamiliar surroundings. Some people would probably say “Nana, it’s not a big deal.” But because I grew up in a city my whole life, it is hard for me to adapt to a new environment, especially out in nature. For me, mountain climbing was the hardest activity. We hiked for about 30 minutes to a rock climbing wall that was as tall as the sky. I was terrified of the height and was nervous to even touch the rocks, but I found myself climbing two different routes. My hand gripped tightly on the hard, grey stone as my feet struggled to move. The blue sky was clear and the wind blew on my face. The green trees filled my eyes, in that moment I caught myself smiling and laughing at my friends and saw a different side I never knew I had. Excitement rushed over me when I touched the handle and finished. I gazed around me and saw that I faced one of my fears, and I was surprised and impressed by how much I actually enjoyed rock climbing. By the second day, I was able to sit on the ground and get my hands dirty. Hiking and actually touching new things is no big deal for me now. Having my friends with me and sharing new experiences together was, I think, my favorite part of this trip. I have been to all the trips except the ski trip, and I definitely think I pushed myself the hardest and had a lot of fun in the three days I was at Lake Sai. 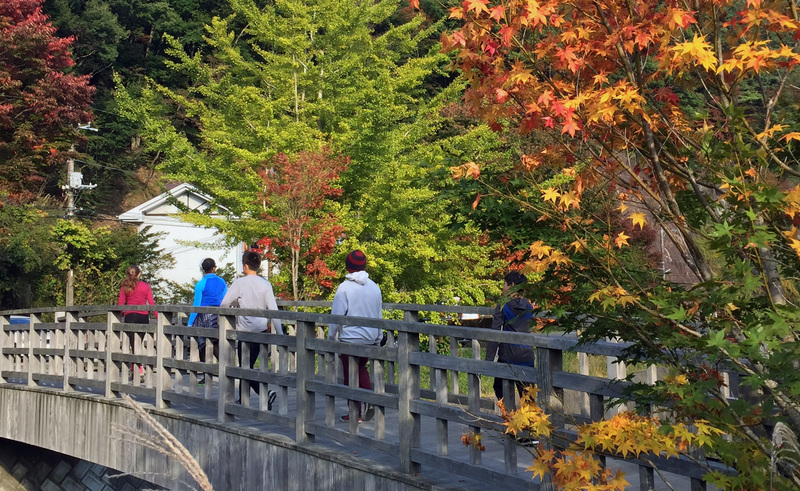 Throughout the Lake Sai trip I learned how good teamwork can expand your possibilities. I also found that having a trustable team is really important. This is because there is at least one time when you need some help from others. For example, one of the group challenges was to climb a 3-meter-tall wall with your team without using any tools. It’s nearly impossible to climb the wall by yourself but, if you work with your team, you can help each other out. When someone was about to give up, we cheered and encouraged them. Even if we didn’t have the same ideas, we worked as a team. It was really interesting how each member had different ideas, weaknesses and strengths (comfort zone). And I think that’s what makes a balanced team. My team, A2, was the most successful. We had great members, the best instructor and teacher. We broke a school record for rock climbing; we were the fastest to finish the raft race for both sessions; we made the best meals and we had wonderful teamwork. But I think what made our team the most successful team was not the results but the steps we took to get to the results.